Lots has been happening here but I’ve been so tired that I haven’t had the energy to blog about it all. A couple of days after Rufus died we lost another hamster. We are not bad owners I promise, he was 2 and half and died very suddenly. Literally one minute we saw him running around the cage about an hour later went to go give the hamsters some veg and he was dead. It was a real shock. Our other Roboroski hamster (his brother) is very frail and loosing his hair (although seems fine in himself, is eating fine and still runs on his wheel like a maniac) and we have been keeping an eye on him as he is so frail, but the his brother appeared perfectly fine. Friday I had to go to the sorting office to pick up a parcel I had to pay customs on (some Lanaset dyes, can’t wait to give them a go) and this means walking past the pet store – not a safe thing to do with Karl, especially on pay day! We have four new additions to our family – 2 Chinese hamsters and 2 gerbils. We have named the gerbils Sooty and Sweep. Sooty is a ginger colour (just the puppet) and Sweep is black. We have yet to name the Chinese Hamsters – this is where you dear readers come in. I’m going to set a contest – choose names for our 2 new Chinese hamsters. I will post pictures tomorrow as need Karl to hold them whilst I snap. Karl and I will choose the winner (which will be our favourite name) but I will also choose a runner up randomly – so everyone is in with a chance, regardless of mine and Karl’s name preference. So, you want to know what you can win – I will post pictures of sock yarn from my stash you can choose from tomorrow, or if you don’t fancy any of that, you can choose something from my shop (at any update, the prize won’t have a time limit) or I will dye something specially for you. To enter all you need to do is leave your answer in a comment to over the next 7 days. I will announce the winners 12th September. Although I’ve been tired I have been knitting, in fact I have some FOs (again will post pictures tomorrow.) I finished the Lola Bunny and This Little Piggy, and have cast on for the Pirate Panda. I have also cast on the Hoodie for Harvey. Its going to take a while but I have until xmas so no rush. I joined the Rugby World Cup knitalong over on Raverly and my project is the Deep V Argyle Vest. I’m hoping to complete it during the tournament. It is easy enough to do whilst watching TV but complicated enough to keep my attention. I also joined the 3rd round of the Monkey Sock Swap – I love knitting this pattern and am looking forward to deciding which yarn to use etc. I have my appointment the first of my tests in London, my 24hr blood pressure monitor will be fitted on 17th Sept at 1130. I’m strangely excited about this as I get to visit Stash Yarns. In the past my regular check-up appointments have always fallen during their summer holiday, but this time they will be open. I think I may have to do some retail therapy. Ogee Lace Skirt, originally uploaded by lyndsey-jane. The Tour de France KAL started today but I was too busy watching Live Earth (how cool were the Foo’s) and trying to catch up on MS3. I plan to start in earnest on Monday (tomorrow is knitting free zone – all will be clear when I post tomorrow evening). I am in the Green Jersey catergory which means I’m a sprinter so I plan to start and finish a project during the race. This skirt had been on my to do list since I saw it and I thought it was the perfect project. At last I have an FO! I loved making these socks, and Emma the recipient loved them too. It is Emma’s legs and feet in the photos. As these were a birthday present I printed a sock wrapper for them with yarn details, washing instruction etc on. I have joined a couple of KALs recently both on Ravelry and in the blogosphere in general. Tour de France – this is a fantastic idea! I have decided to ‘wear’ a green jersey and am challenging myself to complete a project within the duration of the race. The project I have chosen in the Ogee Lace Skirt from IK Summer 07 (scroll down). I am a huge fan of skirts over jeans, and as soon as I saw this I knew I had to make it. Mystery Stole 3 – my first! I had vaguely heard about these but never played along. I have made a lace shawl and enjoy lace but I do find charts difficult – its mainly trying to remember how many of the repeated bit i need to knit. This shawl will be charted but there will be no pattern repeats so I am hoping this will help me gain confidence with my chart reading. I have swatched and decided on my yarn. Zephyr Wool-Silk in Elderberry using 3.5mm needles and matt purple seed beads. The swatch is blocking as I type. Isabella KAL – I really really like this pattern and have some yarn in my stash, a gorgeous pink/red that I need to swatch but fingers crossed I will be able to cast on soon. Finally, Summer of Sock 07. Sign ups are closed now but I managed to sign up in time. I am really excited about using some of my sock yarn stash. Lolly has the sign-ups open for Project Spectrum 2. I joined half way though last year so look forward participating in the whole thing this year. Sign-ups for Sockapalooza 4 should be open at the end of Jan. Keep your eyes posted to Alison’s blog I missed this last year so hope to join this year. I also joined the TBR challenge 2007. The idea being to read 12 books that have been on your ‘to be read’ list during 2007. I have been busy joining as I also joined the Lime & Violet Sock Marathon. 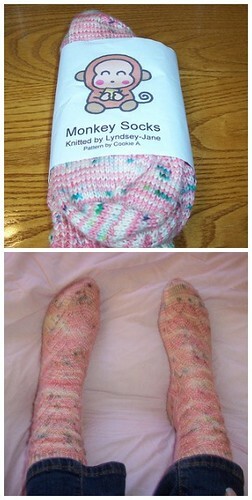 This is a Flickr group and the idea is to see how far you can knit your sock yarn. I have 5.4miles of sock yarn but that doesn’t count my recently purchased Lime & Violet and Violet’s Pink Ribbon from Lisa Souza, which I am waiting to be delivered. It will be cool to see how far I get in three months. On a sock theme I also joined Socktopia, each month three themes are given and you chose one knit a pair pf socks around it. The Wicked sweater is going really well, I am just starting the waist decreases. I will get a progress shot over the weekend. I should get some done tomorrow as I am meeting up with a uni friend to teach her to knit. Wish me luck! I use my desk for my studying so all the books around me are science/medical. So I joined the Stranded and have been searching for the perfect project, something that I can get to start over the holiday peroid (i.e. something from the UK and not something that has to travel overseas at the busiest time of year). Someone must have heard my desparate pleas as I have found the perfect project in the new Knitty – corazon, pink and white stranded mittens with a heart inspired fair isle pattern. 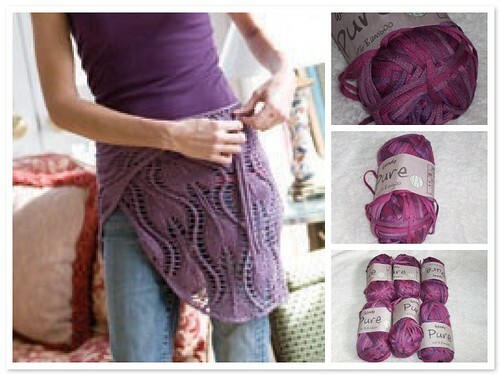 I immediately phoned my mum and she is getting the yarn and needles for my for xmas – gotta love the mum! I am not going to be using the stated yarn for two reasons, one i wanted a really soft yarn and having used this before its not that soft and secondly,I couldn’t find the colours, so I am trying a new yarn. It is by Sublime, a reasonably new company whose yarn I’ve yet to use, and is the Baby Cashhmere Merino Silk DK in Vanilla and Piglot. I have looked at these yarns before but they colours are very muted and subdued which isn’t something I’ve been looking for in previous projects but for this it looks perfect. After three attempts I have given up on the Swallowtail Shawl for now, until at least I go to my Mums and photocopy and enlarge the charts. However, having seen Piglottie’s Forest Canopy Shawl in a Rowan Tweed 4ply (a similar yarn to the Rowanspun 4ply i was going to use for the Swallowtail) I think I will use the Rowanspun to make myself a Forest Canopy Shawl. I have 5 x 25g so will make it slightly larger like Piglottie’s. Hope everyone is having a good run up to the festivities. If I can persuade Karl we may well get the decorations out this weekend! I have been busy knitting my Xmas gifts. I completed the second of my stepdads bed socks and also managed to finish my mums hat. I also completed another two washcloths. FO pictures soon. I can’t see it being a problem as I can knit up until xmas eve, what is worrying me however is that the yarn for my Shetland Shawl will arrive very soon and it is going to take alot of willpower to not cast on and knit that instead. I received an e-mail today saying that the Sock Hop yarn I ordered has been despatched. I can’t wait for it to arrive. I plan on using two of the skeins to make a pair of RPMs. Whilst reading socks-for-mum I learnt about Stranded – the colorwork challenge. I had been thinking about learning colorwork as one of my new years resolutions and this is just the help I need. I joined up right away. I am looking for a simple beginners pattern, something small like socks, mittens or a hat. If anyone has any suggestions please let me know. I have my eye on the Fiesta Mittens and I love all of these Red Bird Knits socks. I found the Red Bird Knits website today, they have the most wonderful sock patterns. Talking of colourwork there is lovely free pattern for a hat over on brooklyntweed. This is definetely on my to-do list. The rain appears to have quitened down now so I shall try to get some sleep before Uni tomorrow and 3hrs of genetics. I feel a LARGE eggnog latte with extra shot being needed.